Recently I was at a dinner party chatting with strangers about the usual things. Where are you from? How do you know so-and-so? What do you do? And of course, the very typical New York question: What neighborhood do you live in? There is a general assumption about someone’s station in life based on the neighborhood they live in. If you live in the West Village you’re probably not bagging groceries. Most of the dinner party attendees lived in cool Brooklyn neighborhoods. I grew up in lower Manhattan, which gives me a bit of street cred with the non-natives, but when they hear that I still live downtown they’re confused… I just told them I had a degree in English and I freelance occasionally, how could I afford Manhattan? When I reveal that I live in a one-bedroom apartment in a doorman building in Battery Park City, where the average monthly rent for an apartment like mine is upwards of $4,000, they’re really confused. The truth is, I live in an 80/20 apartment building—in a '20' apartment. A 500-square-foot one-bedroom for which I pay $650/month. If you’re not familiar with the 80/20 program, it is a government program granting developers tax-exempt financing to construct multifamily rental developments provided that they offer at least 20 percent of the units to low-income tenants earning less than 50 percent of the area median income. The median household income for Battery Park City is around $108,000. I was one of the lucky winners of the housing lottery for a spot in a residential development in Battery Park City. I don’t know how many people sent in applications but I’m estimating that winning the lottery for one of these magic apartments is about as likely as being struck by lightning. The building I live in is located in lower Battery Park City and is not one of the new LEED platinum certified, sustainable green buildings with state-of-the-art fitness facilities, lap pools and play rooms. Compared to those, my building is pretty bare bones. We only have storage rooms for luggage and bikes, a small gym and a set of washer-dryers on each of the nine floors. Still, paying $650 a month for a 500-square-foot one-bedroom in a doorman building is a great deal...with an expiration date. After 15 years the owner/developer of the building may opt out of the program and rent out the low-income 20 percent apartments at market rate. I think this program was dreamed up by a real estate developer who thought to himself…how could we get funding from the government to build luxury apartments…I KNOW! Throw in a few poor folks then kick them out in 15 years. Aside from feeling like an imposter living on borrowed time, there are some ongoing requirements for this program. I must submit to a series of yearly recertification interviews with six months worth of bank statements and pay stubs, IRS transcripts and notarized letters from my employer, school and bank to confirm my employment, status and checking account balance. I have to take days off of work for home visits and lease signings. And if I fail to meet any of these requirements or can't take off work for the interviews, or exceed the 50 percent area median salary requirements, I get evicted. There are also absurd restrictions for the low-income tenants that don't apply to market rate tenants. For instance, I am never allowed to have anyone live with me in my apartment. And it took me twice as long to finish college because full-time students are not eligible for the 80/20 program. Rather than lose my apartment when I moved in at 19, I earned my degree part-time at Hunter College, delaying my graduation by four years. While other graduates were out gaining experience and moving up in their chosen field, I was years behind my peers and eons behind the other 80 percent living in my building and the rest of the neighborhood. Don’t get me wrong. The deal is nice. 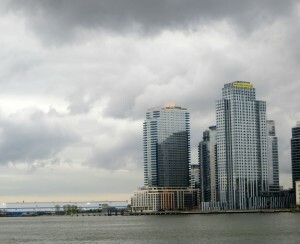 I get cheap rent, great neighborhood, doorman building, free gym, laundry on every floor and Battery Park! Plus, the general upkeep of a luxury building is impeccable. When I hear some of my friends’ horror stories about rats and heat and garbage days vs. recycling days…my head spins. Sure I love living in a beautiful neighborhood surrounded by parks but I also feel really out of place. There isn’t a local café where struggling artists and writers hang out and feel like they’re in it together. I can’t lean over and lament the $8.99 price of coconut water to the woman next to me at the Battery Market because her handbag costs more than my rent for a year…maybe two. On the other hand, with my extra savings from cheap rent I am able to travel the world and buy nice things. Which means that in an 80/20 lineup, you probably wouldn’t pick me as a 20. I have, in fact, a little game I play called 80/20 profiling, trying to pick out the other 20s in the building. I assume the ones doing their own laundry (like me) are 20s and the ones getting laundry delivery from the local (expensive) dry cleaners are 80s. The 80’s also get friendlier hellos from the doorman (this might be because the 80s holiday envelopes are fat and the 20s envelopes are slim.) The 80s get Whole Foods delivered and the 20s schlep Fairway bags in from Red Hook. I try to share a knowing nod with the other people in my building who I think are 20s but there isn’t the sense of camaraderie you would think. You won’t find a band of 20s hanging out in the hallways scheming to overthrow the 80s. I guess everyone just wants to blend in. The 20s are dispersed evenly throughout the building to create the illusion of equality, which makes my little profiling game challenging. Also, 20s are allowed the same access to amenities as the 80s. Generally, 20s are treated exactly like every other tenant in the building…except during the annual recertification season. We’re rounded up for examination to assess if we can stay. Only after our paperwork is pored over and our status is scrutinized do we get back to feeling like one of the bunch. After years of this process you would think I’d get over it and just feel grateful for the privilege of living in a 20 apartment. But I can’t get over feeling a little bit degraded, like a second-class citizen hiding out in first class. I feel as though I'm constantly reminded that at any moment, any paperwork error, any step out of line, can make it all go away. 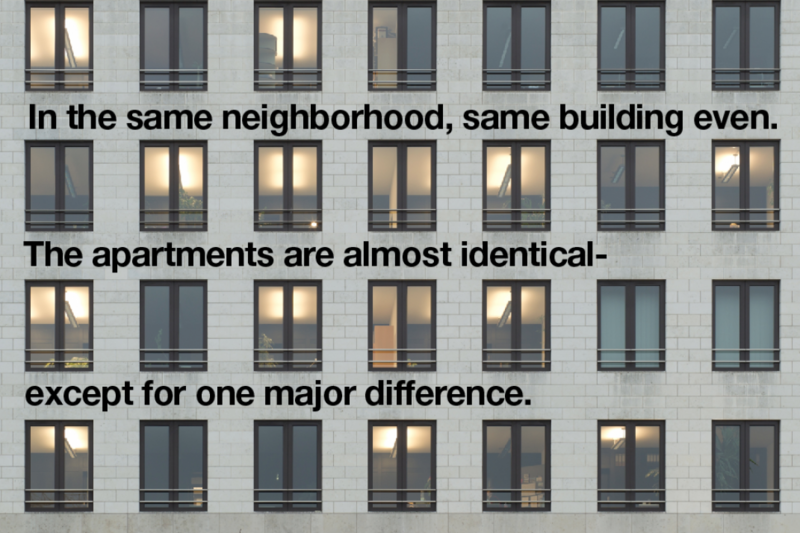 I think the growing income inequality in our country--in our city especially--is in particularly sharp focus for people living in 80/20 buildings. And I'm one of the lucky ones. There are thousands of lower-income people piled on top of each other across the city in cramped spaces, in dilapidated buildings, in neglected neighborhoods who deserve access to clean, safe and affordable places to live without having to win lotteries and jump through hoops. Which is why I think this program should be 50/50 instead of 80/20.